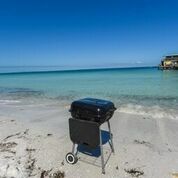 Nothing sounds more like a beach vacation then grilling and relaxing by the water. This charcoal grill is great for a relaxing day by the pool. Have a night in and make some delicious food on one of our grills. The size of our grills are 560 square inches and includes a warming area that allows you to cook everything at once and then serve without having to worry about serving cold food. Our charcoal grills even feature a slide-out ash receiver so you can get back to relaxing faster without having to worry about cleanup. To ensure ultimate ease we even include the charcoal.